Now I’m not for one moment suggesting the latest work to stir controversy, Mear One’s ‘Freedom for Humanity’ painted in the East End of London is comparable to Picasso in its content, message or delivery. But they are in similar vein. I am not highly skilled at using the image manipulation software tool Photoshop. In the primitive 1960s – when I trained as a film and TV designer – colour TV had not been invented and Daleks could not yet climb stairs. Thus I am certainly not as competent as the whizz kids who work in the BBC Newsnight graphics team. 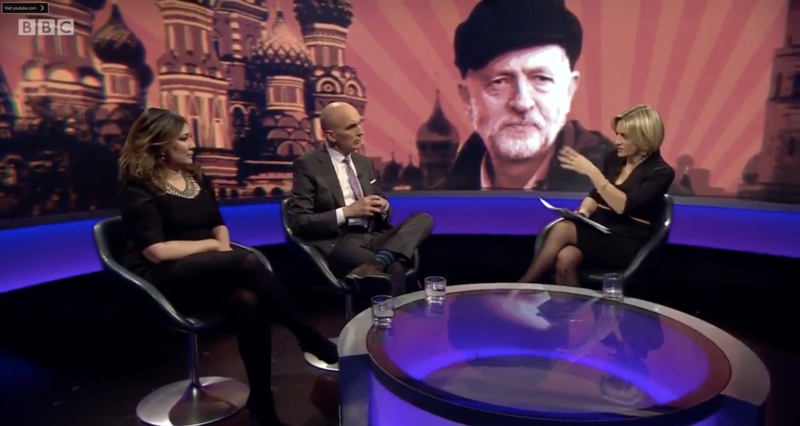 It took me some time and experiments with several techniques to transform Jeremy Corbyn’s well-defined jaunty Donovan-style cap into a reasonable likeness of a Russian fur hat and place the thus manipulated image in a sufficiently low resolution to enable it to be projected on a Kremlin-sized backdrop without revealing the hat’s clear 1960s provenance. In an era when every TV presenter worries that their every blemish and facial tic will be projected in startling detail it must have taken a firm directorial steer and the exercise of considerable talent for the Newsnight team to produce an image of such mannered fuzziness. This was done, perhaps even without mature reflection, to serve the dominant media discourse that presents Jeremy Corbyn as a flaky eccentric whose politics are inflected with a doubtful patriotism. Akehurst is a Labour Party activist of Blairite sympathies whose failure to keep up with new times in the Labour Party has married his dismay at Corbyn’s popularity with an Orwellian anti-communism. 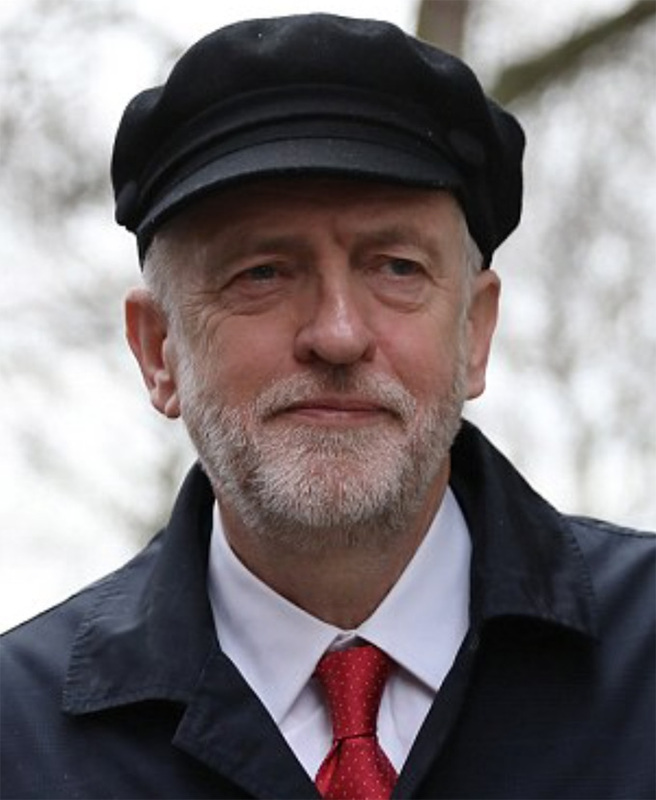 He advises a zero tolerance stance towards people within the Labour left who self-describe as “Communist” in their social media profiles or promote theories like “fully automated luxury Communism” and stop employing people from the Stalinist “Straight Left”/CPB tradition in the leader’s office. Ending “solidarity” with vile regimes like Cuba and Venezuela and providing ideological clarity “that they are not seeking to abolish capitalism and replace it with a command economy” are necessary steps. He says that Labour supporters should stop apologising for or giving the benefit of the doubt to Russia over its contemporary behaviour regarding assassinations in the UK, the occupation of the Crimea, and its military actions in Syria and stop promoting and writing for the Morning Star, the former newspaper of the CPGB, and appearing on Russia Today. Until then, he says, the media is going to portray you how you present yourselves, so live with it. We can set aside the political illiteracy which conflates the popular but rather prosaic policy proposals that Britain’s communists share with most of Labour’s millions with playful ideas like ‘fully automated luxury communism. We can even write off, as the sour grapes of a ‘deselected’ Labour party office holder and NEC member, the suggestion that the “Stalinist” team that helped Corbyn revive Labour’s electoral fortunes cease their efforts. Anyone with a sense of historical fact will find bizarre the idea that much of contemporary anti semitism is derived from the Soviet era. Akehurst is making an equivalence between the Soviet Union, which stopped fascism, with nazi Germany, which made the extermination of Jewish people its state policy. Luke Akehurst wants to “show solidarity with Labour’s social democratic sister parties.” But his suggestion that social democrats refuse any connection to political forces that have an affinity with, historical connection to or shared ideas with the communist tradition would put many social democratic parties in a very difficult position. Throughout the world Labour’s sister parties find their enemies not to the left but on the right. The Partito Socialista Portuguese government would fall without communist parliamentary support, the SPD would lose control of several German lander, thousands of French, and Spanish municipalities would fall to the right, in Italy the right would rule unchallenged. Swedish and Danish social democratic governments have ruled with parliamentary communist support. In South Africa the political heirs of apartheid would have a chance. In India the big debate is whether Congress should ally with the communists to block the BJP. Obeying his injunction to break solidarity with Cuba and Venezuela would make pariahs of Latin American social democrats. The Workers’ Party governments in Brazil included Communist Party ministers, while in Chile, Ecuador, Paraguay, Uruguay, Guyana, Nicaragua, El Salvador and Dominica progressive governments have counted on communist support. In fact, while Labour is only an observer at the Socialist International a whole number of rebadged former marxist-leninist east European and African parties are full members. Presently our economy is under the ‘command’ of the banks and big business and our media dominated by billionaire non doms. We live in a world of corporate capitalism – from klepto-capitalist Russia to tax avoiding firms domiciled in British dependencies. Labour needs to convince the millions of ordinary people in Britain who desperately need a Labour government to, as Luke says, end austerity, restore our public services and promote a more socially just and equal society. This means a government that it is serious about socialism. Luke Akehurst’s proposal to boycott the Morning Star is a policy pioneered by Tory governments, imitated by a succession of post-socialist governments of Russia and continued by Putin’s regime. Labour’s struggle with a biased BBC and the big business media might be aided if more people were encouraged to read the Morning Star. This is a newspaper published by a cooperative which counts thousands of working people, trade unions and popular organisations among its shareholders and is managed by a board comprised of people elected in a series of nationwide meetings and buttressed by representatives of a score of trade unions who hold shares. The Morning Star policy is to give a platform for the widest range of progressive opinion. As its long-standing contributor Jeremy Corbyn says: “The Morning Star is the most precious and only voice we have in the daily media”. Luke’s appeal to the tradition of Attlee and Bevin throws up the problems in his approach. But it struck a chord with me. My grandfather, a follower of William Morris, a veteran of the Social Democratic Federation and its successor, the Labour-affiliated British Socialist Party, told me stories of when he was in the same East London branch as Clement Attlee. In 1920 the BSP was the main constituent of the newly formed Communist Party. Fred Bruce, my grandfather, was a skilled cabinet maker who worked for decades among Jewish craftsmen, and regarded Ernest Bevin was a rank colonialist and anti-semite. Indeed, if half the remarks attributed to Bevin are true he would find himself suspended from party membership today. Luke might be surprised to know that for many years communists sat in parliament as Labour MPs, represented their unions at party conferences and served as councillors. He will be alarmed with the knowledge that during the war an Amalgamated Engineering Union motion to Labour’s conference to admit the Communist Party as a Labour Party affiliate was only narrowly defeated. The Cold War conditions which made unity on the left an impossibility no longer exist. And the crisis conditions of contemporary capitalism make socialist solutions an imperative. Electing a Labour government on such a manifesto issurely something we can all agree on. Labourlist has yet to respond to my invitation to respond to Luke Akehurst. To mark the end of International Women’s Day we bring you a song that goes a long way to dispell stereotypical notions about gender roles.